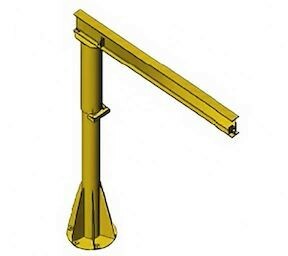 The Handling Systems International Model 350 light duty pillar base mounted jib crane is economical, and is ideal for processes that involve light assembly, welding, or any application where capacity and use are low. Self-supporting 360 degree rotating jib crane. Mounts to floor using Handling Systems anchor bolts and recommended foundation or existing floor depending on crane specifications. Bottom thrust roller consists of two self-aligning, heavy duty, sealed cam follower type bearings. Head consists of heavy wall pipe with roller axles and boom connection plates. Assembly is jig welded to insure dimensional square-ness. Rolled steel I beam or wide flange beam to fit most standard hoist trolleys. Girder is equipped with removable end stops for quick trolley installation and maintenance. Mast is heavy pipe column with top bushing and housing. Welded steel base plate and gussets are provided for rigid mounting. All structural steel will be painted with one coat standard safety yellow enamel, unless otherwise specified. 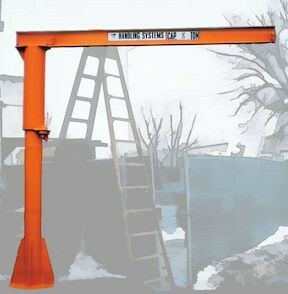 Hoist Allowance: The total hoist allowance is 15% of the stated capacity. 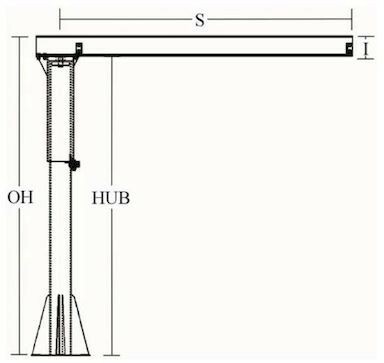 NOTE: Anchor Bolts and Template can be shipped out prior to the jib crane so the customer can install foundation and decrease down time. Call 1-800-509-6131 for Freight Quote.